The Last of the Haussmans, the second National Theatre production to be transmitted this season in the HD series NT Live, is the first play written by the actor Stephen Beresford, but you’d never guess because it’s bursting with confidence and it has a distinctive vision. Like the Lisa Cholodenko movies Laurel Canyon and The Kids Are All Right, it’s a high comedy that focuses on the repercussions of the sixties, but it doesn’t go soft (as Laurel Canyon did) or rigid (as The Kids Are All Right did); it’s a resolutely fair-minded satire that turns unexpectedly poignant. The great Julie Walters gives an exuberant, high-style performance as Judy, a hippie whose tireless quest for self-exploration led her to abandon her two children to be raised by her parents. Now she’s in her sixties, they’re fortyish, and brother and sister are drawn to the house on the Devon Coast she inherited from her parents when she undergoes surgery for melanoma. Libby (Helen McCrory), the elder sibling, has been raising her fifteen-year-old daughter Summer (Isabella Laughland) by herself – until Summer’s long-absent dad decides to re-enter her life and invites her to spend part of the summer with him and his new wife in France. Libby is on the rebound from her latest unsuccessful amour. 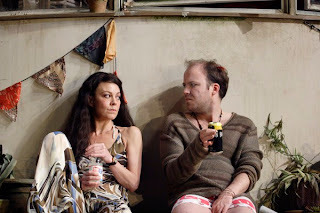 Her brother Nick (Rory Kinnear) is a gay man in a perpetual state of heartbreak; he’s also a recovering junkie. Their relationship with their mother is sometimes strained, often ironic, and irresolvably complex. The other characters are Judy’s doctor, Peter (Matthew Marsh), who is cheating on his wife with Libby, and a laconic nineteen-year-old named Daniel (Taron Egerton) who arouses Peter’s paternal instincts, Nick’s libido and Summer’s teenage interest, but develops his own crush on Libby. However, the household revolves around Judy, who is just as free a spirit, just as outrageous and irrepressible and infuriating, as she must have been when she walked away from her children to join an ashram decades ago. The plot makes the play sound like a sexual roundelay but Beresford doesn’t take it chiefly in that direction. He’s more intrigued by the characters – and God, does he know how to write them. In an interview before the HD screening, Beresford related how knocked out he was when Nicholas Hytner, the National’s artistic director, called him up to tell him they’d decided to produce his play, the dream of any novice English playwright. When you see The Last of the Haussmans, you can’t imagine how the National could have made any other choice. The jokes are often hilarious and the roles are so rich that the actors practically sing with them, especially Walters, McCrory and Kinnear. Mind you, these are actors of such high caliber that Beresford could only have imagined, during rehearsals, that he’d died and gone to playwrights’ heaven. North American audiences would mostly register Walters from seeing her in the Harry Potter pictures (she plays Mrs. Beasley) and, if they’ve been around long enough, from Educating Rita, in which she recreated the West End role that made her a stage star in London. They might recognize McCrory, who’s appeared in a variety of character roles in movies (most recently as Madame Méliès in Hugo), but Kinnear, whose Hamlet is almost legendary in the English theatre, is unknown on these shores. As McCrory plays Libby, her wry, stinging intelligence sits on top of a desperate loneliness that leads her to make dreadful mistakes out of love. But she seems grounded by comparison with Nick, who’s deeply neurotic and self-dramatizing and, as he has an addictive personality, drinks too much. This brother-sister combo are literate and witty – fools whose salvation is their acute awareness of their own follies. By contrast, Judy embraces her decisions; she never regrets anything. But as much as Beresford sends her up, he allows her the courage of her follies and he and Walters make her the belle of the retro-sixties ball. She inspires Daniel, whose last-scene tribute to her is quite touching, and she reminds Peter of his own left-wing youth. She also exposes, by contrast, his inauthenticity. He turns out to be a self-interested manipulator, the one character whose actions the play, which balances satire with open-heartedness, can’t sanction. 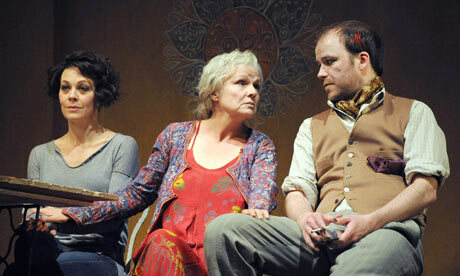 It’s a splendid play, though the language is dense enough that just reading it doesn’t do it justice. The production, directed by Howard Davies and built around the remarkable performances of Walters, McCrory and Kinnear, absolutely does. Not every show mounted at the National is a triumph, but based on the NT Live slate this season – The Curious Incident of the Dog in the Night-time, Haussmans and the Simon Russell Beale Timon of Athens I reviewed last week – you’d think they couldn’t put a foot wrong. This series is a gift to theatergoers all over the world, most of whom wouldn’t otherwise get the chance to see any of the National’s offerings. The rest of the season includes a revival of Arthur Wing Pinero’s Victorian farce The Magistrate starring John Lithgow and two more new plays, including the latest by Alan Bennett, the best living English playwright. I can hardly wait.